Steadlur is a four-piece rock band from Georgia formed by Philip Steadlur and his brother, drummer Dallas Steadlur which also features Tommy Steadlur (lg) and Daniel Steadlur (b). The latter two are of no relation to the brothers, only taking the last name for solidarity; however, with a quick glance, all of them could have come from same trailer park, if not the same trailer. Steadler's music is southern (without the grits, twang or Nascar) leather, whiskey and sweat rock and roll that easily borrows from late 80's GnR or Skid Row and 90's alt hard rock. Their debut busts out of the gate with four brute and ballsy rockers. Poison and Bumpin (the single and first video) are easily the best barroom brawlers going: quick, rowdy and nasty. Philip Steadlur follows in the long line of Jack-throated vocalists. My Mom Hates Me blends a punkish vibe with hilarious lyrics which can only remind one of The Ramones. Of all songs, Turn It Up drops you onto Sunset Boulevard 20 years. It's a great start. However, from here this self-titled debut begins going south in energy and predictability on a slippery slope. It's Too Late begins the slow injection of modern rock trends that come to fulfillment later, from Suffocate to the end. In between, Whiskey and Women, offering a creative guitar solo, and Angel (On The Wrong Side Of Town), delivering an unexpectedly serious hard rock ballad, are clever pieces. The last four pieces, with the exception of Change, mine the monotony of the latest modern hard rock so predictably to be a blur. Change delivers differently thanks to versatile guitar craftsmanship and a strong vocal arrangement. 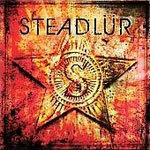 Steadlur is another fine example of the new wave of American hard rock that merges the past with present for some boisterous and believable, salacious and sweaty rock and roll. Unfortunately, a good start finishes poorly as Steadlur errs on the side of common modern rock trends on the latter half.